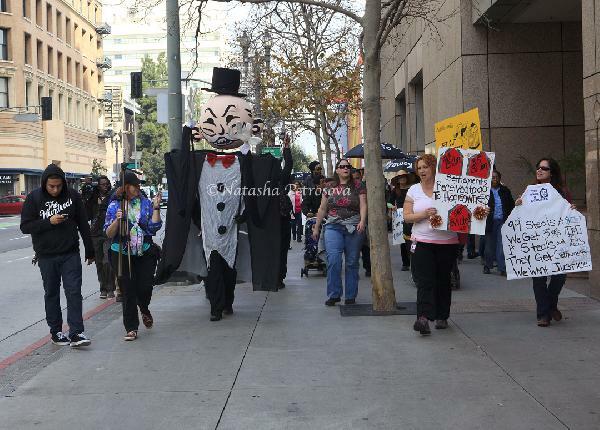 "No, we don't want the money" said homeowners as they gathered together with Occupy Fights Foreclosure activists on Wednesday afternoon in front of the United States Court House. Carlos Marroquin said "We denounce the agreement made by United States government officials. This is an inside agreement that only benefits the banks and not homeowners. It releases the banks from liability. The banks just will pay off and walk away, while millions of families got displaced. "It is offensive , it is criminal and it is fraudulent to reach this kind of settlement with the criminals" Marroquin added. OFF held a press conference in front of the Federal building where homeowners were able to tell their stories and openly denounce the recent $10 billion settlement. After that, homeowners and protesters marched down Spring street to California Attorney General, Kamala Harris' office chanting "Banks got bailed out, We got sold out". Mrs. Harris did not meet with the homeowners and protesters. She conveniently was not in her office or anywhere in a building. The activists and homeowners marched in a circle chanting " no settlement, no way, prosecute the banks today". At this point it remains unclear when homeowners will receive the money, how much will each homeowner receive, or if the dollar amount will justify the financial and emotional damages that were inflicted on them by the banks. What is clear, however, is that homeowners are devastated, the resistance is growing, homeowners are not willing to settle and they are eager to fight for what they feel is right.